"This made for a very enjoyable lunch, and kept warm in a slow cooker, could also work very nicely for a Super Bowl party. 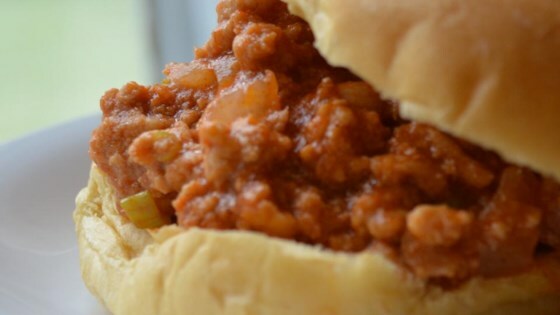 It tastes enough like a traditional beef Sloppy Joe to provide that satisfying comfort food fix, yet seems much lighter." Melt butter in a heavy skillet over medium heat. Add onion; cook and stir until onion starts to brown, about 5 minutes. Season with salt and black. Mix ground turkey and 1/2 cup cold water into onions. Cook and stir, breaking up the meat, until it begins to brown, about 2 minutes. Add ketchup, brown sugar, cayenne pepper, salt, and black pepper. Cook and stir until liquid is reduced, about 5 minutes. Stir in Worcestershire sauce and cocoa powder. Cook, stirring frequently and adding up to 1 cup water if needed, until meat is cooked through and liquid is reduced and thick, 20 to 30 minutes. Preheat the oven's broiler and set the oven rack about 6 inches from the heat source. Toast hamburger buns until golden, 2 to 3 minutes. Remove turkey mixture from the heat and mix in green onions and Cheddar cheese. Serve on toasted hamburger buns. I added 2 tsp. of white vinegar and garlic power, made a world of difference! This was FANTASTIC! I will definitely be making this again...and again...and again.